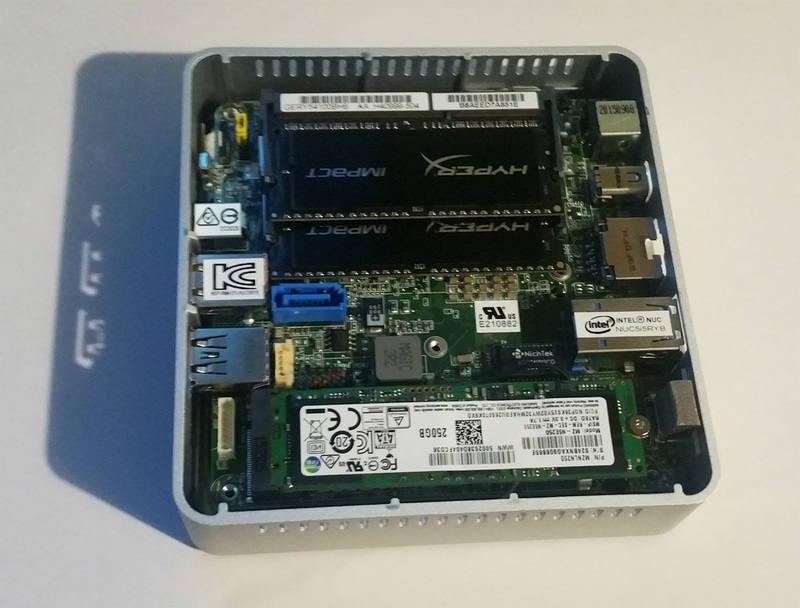 This is the Intel NUC5i5RYK Mini PC. Its size is only 115 x 111 x 32.7 mm. It comes equipped as standard with an Intel Core i5-5250U CPU (2 core, 4 thread with HyperThreading, 1.6 GHz with 2.7 GHz turbo), four USB 3.0 ports, a Gigabit Ethernet port, 802.11ac Wi-Fi (Dual Band 2.4 GHz and 5.0 GHz) antennae and Bluetooth 4.0. The graphics processor on it is not going to compete a terrible amount with high-end gaming graphics cards, but the Intel HD Graphics 6000 chip comes on-board and is more than sufficient for all general software use. The motherboard itself supports up to 16GB DDR3L-1600MHz 1.35V RAM in two 8GB sticks. This has to be bought separately however. 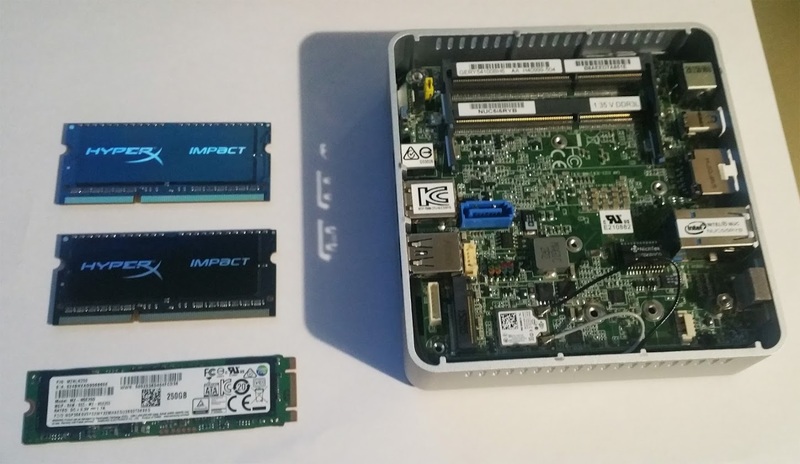 Moreover, given the thin form factor of this particular model, it features one of the latest M.2 slots for an SSD for storage. There are thicker form factor versions that also support standard laptop 2.5 inch SSDs and HDDs. The storage medium also has to be bought separately. I chose to go for this particular model to have a thinner overall computer and to benefit from the speeds afforded by the M.2 standard. Lastly, a display can be connected to the Mini PC via its on-board Mini-HDMI 1.4a or Mini-DisplayPort 1.2 ports. It also comes with a standard 3.5 mm jack for audio output, though 7.1 surround sound playback is also possible through the HDMI connection. Above is the Mini PC opened up. To the bottom-left is the SSD I chose - the Samsung 850 EVO 250GB M.2 SSD. The two sticks above the SSD are the RAM I chose - Kingston HyperX 16GB (2x8GB) DDR3L-1600MHz 1.35V RAM. I was very surprised at how small M.2 SSDs are. This choice of SSD can also be purchased in a 500GB capacity. With the Mini PC hardware set up, I hooked it up to a TV via HDMI and installed Windows 10 Pro on it, along with all the drivers and software I need. I made sure TeamViewer was installed and made it start with Windows so I could gain remote control without a hitch. 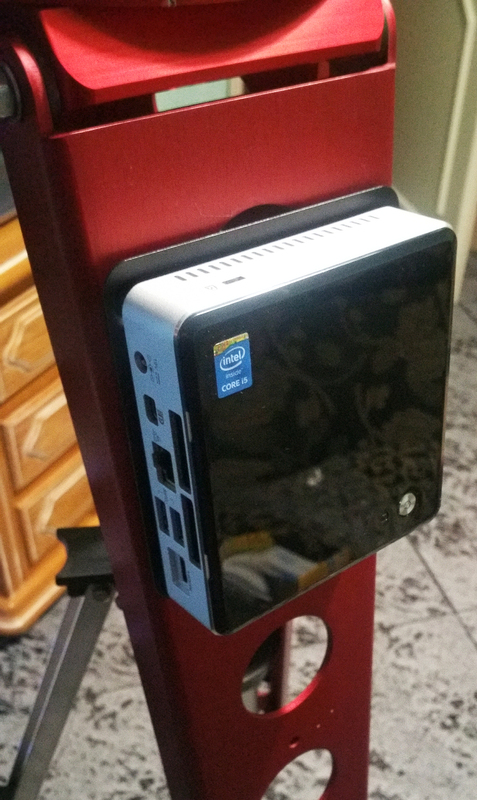 The Mini PC comes with a VESA mounting bracket, which with two screws placed on the back of the Mini PC, allows you to slot the Mini PC into the bracket. 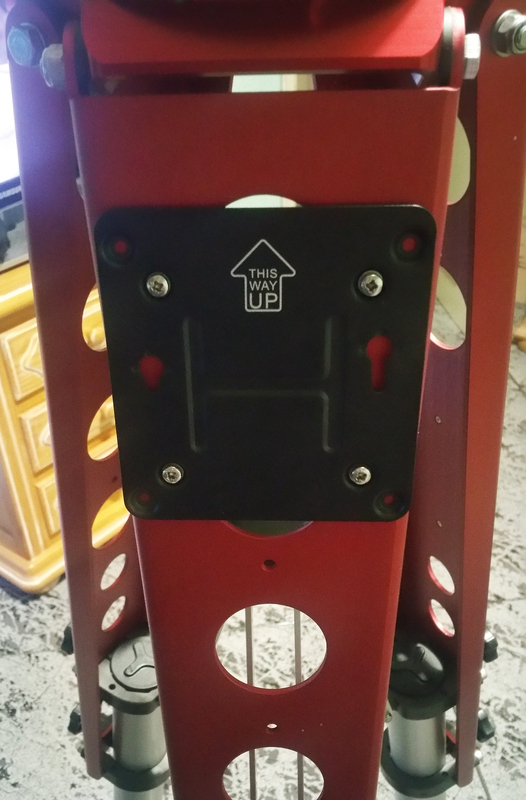 The main intention is for users to hang it behind a TV or monitor with VESA mounting holes on the back. Back when I did not have a permanent setup in a remote observatory, I thought it would be a great idea to drill and taper some screw holes into my mount tripod in order to allow me to hang the Mini PC off it. The fact that it has four USB 3.0 ports is fantastic, as it can run most if not all equipment without the need for a USB hub (mount, autofocuser, autoguider and imaging camera). Inside the Mini PC is a USB header that can provide two USB 2.0 ports as an extra, giving you a total of six USB ports. Please see the comments below this article for links to some addons you can use to provide the two USB 2.0 ports. Even if you have no Internet access where you are, with a DHCP reserved IP address entered into the router, you can switch on the Mini PC, it boots into Windows and connects to the Wi-Fi network automatically, with the same IP address as always. TeamViewer can then connect via the local network IP address of the Mini PC. If you do have Internet access at your imaging site however, then the TeamViewer ID can be used to connect as normal. Either way, you gain control over your entire astrophotography setup. 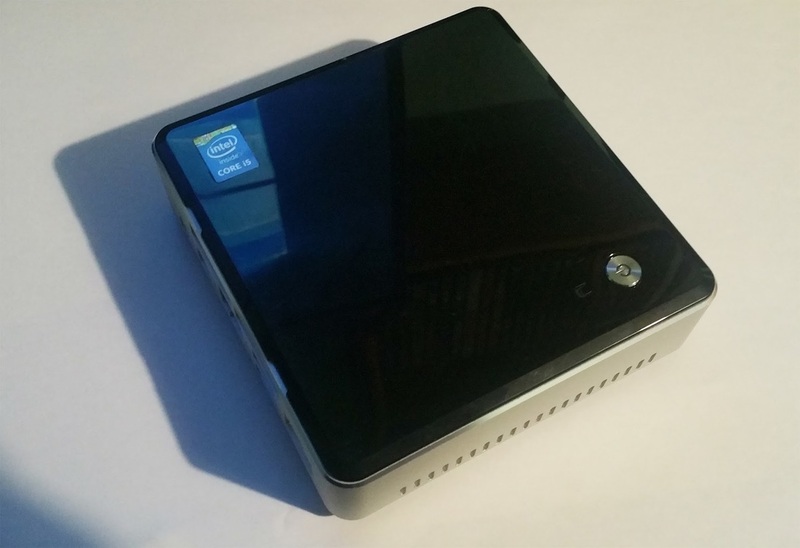 For anyone interested, the Intel NUC5i5RYK Mini PC is about £267 without VAT, the Samsung 850 EVO 250GB SSD is about £81 without VAT and the Kingston HyperX 16GB (2x8GB) DDR3L-1600MHz 1.35V RAM is about £67 without VAT. That comes to a total price of just £415 (without VAT) for the whole system. Considering it costs less than a half-decent laptop and that the price includes all those amazing hardware features (the fast HyperThreaded CPU, 16GB of RAM, a 250GB M.2 SSD and four USB 3.0 ports) and at the tiny physical size and weight, it is definitely worth considering. Anyone who wishes to power this Mini PC through a standard 12 V Marine Deep Cycle or compact Lithium-Ion battery can do so. Apparently it is rated to run at 12 V without a problem and has been reported to function even at a voltage as low as 10.5 V (see comment section at the bottom of this article). The DC power plug of the mains adapter has an inner diameter of 3 mm and an outer diameter of 5 mm. It should be easy to source two-core cabling, a pair of connectors (e.g. small crocodile clips) and an appropriate DC power plug to fashion together a power cable to run the Mini PC from said battery.